The Last Starfighter is my first memory as a human being. Not the first movie I remember seeing—the first thing that I remember at all. Suffice to say, it’s been a pretty formative piece in long time love of science fiction, games and more. Even so, I hadn’t watched it in years, and I’ve got to say it’s pretty fascinating. 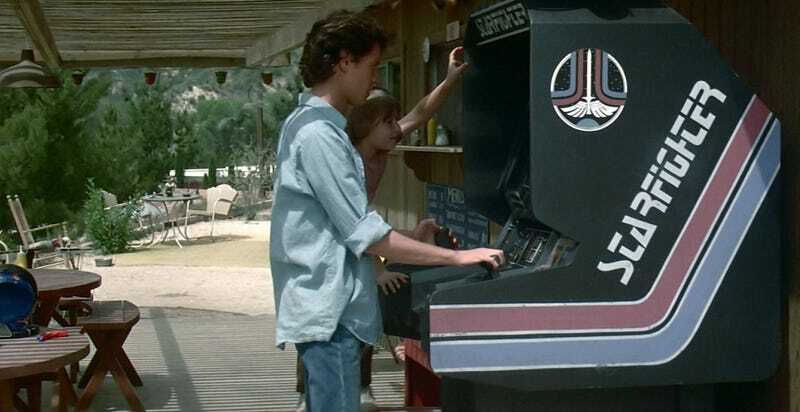 In The Last Starfighter, a young man named Alex Rogan (Lance Guest) is a teenager living in a trailer park, desperate to get out into the world. His one taste of success comes from breaking the high score on the local video game machine, Starfighter. And then, he finds out that his high score has qualified him to actually go out into space and help defend the universe, just like in the game. Watching the film today, one thing becomes abundantly clear. The Last Starfighter was way ahead of its time, and this both kills it and helps it. Narratively, the idea of a video game being a secret recruiting tool for a huge military operation is something that seems way more appropriate now, 30 years later, than it did in 1984. At that time, video games were popular but were a few years from really exploding in a mainstream way. Today, that billion dollar industry is so prevalent and accepted, the idea feels almost too realistic to be a science-fiction plot. On the other hand, Last Starfighter is one of the earliest films to have full sequences that are completely computer generated. This, of course, has become the norm, but watching these scenes now, it feels like watching stick figures in a computer animated world. Atari versus PlayStation 4. It’s jarring, and not just in a kitschy way. However, the reason this film can even be mentioned in the same breath as other genre classics is because the things is does right, it does so right. From the opening second of the film, the score by Craig Safan soars. It’s the kind of adventure score you dream about: rousing, catchy and fun. Immediately you have the urge to whistle the crap out of it. In fact, let’s leave it here so you can listen while you continue to read. From there we move into the human aspects of the film—Alex’s struggles with his dreams, his family, his girlfriend etc.—and it’s all very universal and relatable. In fact, over the course of the movie, the stuff on Earth blows away the stuff in space. The aliens, new planets, spaceships, that’s all well and good. But meanwhile, an android “Beta” unit is sent to Earth to replace Alex so nobody notices he’s gone. And meanwhile, Alex struggles to accept this fate. All of the supporting characters, including Alex’s brother and girlfriend, really keep the film fun and interesting. For example, Alex gets recruited by Centauri (an energetic, underrated performance by the late great Robert Preston) and the pair venture into space. As an audience member, this is what you’ve been waiting for. And yet Alex rejects this opportunity. He says “No” to the idea of being an intergalactic hero, and goes home. Of course, this swerve doesn’t last for long, but its a great sign of the ways in which Alex’s character is more important to the movie than its spectacle. The film would rather do right by its characters than get immediately into the space stuff. Actually, once Alex does embrace his importance and go off on his mission to defeat Xur and the Kodan Armada, the film fades a bit. It’s a very straightforward, simple shoot-em-up space mission, and the biggest move they make is to hide. In fact, I was kind of surprised how underwhelming the whole big action scene felt. It wasn’t until the very end of the film that you really get a feeling of accomplishment. Alex goes home, reveals his exploits to the trailer park, embraces his role and moves to space. That’s the real payoff of the movie: Alex the human becoming Alex the Starfighter, and his family and friends accepting it. Watching him rotate around in a swivel chair pales in comparison. Which, again, speaks to the duality of the film. The story is so strong, and the characters so good—and yet in this space-adventure, a group of crazy characters in a trailer park “ooing” and “ahhing” at a video game feels more awesome than everything else. Thirty-plus years after its release, The Last Starfighter remains insanely watchable and fun. The flaws are evident, but they have little to do with the script by Jonathan Betuel or direction by Nick Castle. The whole thing is a product of its time, for good and bad, and deserves to be remembered for both. Check out some of our older posts on this cult classic.